One of the most exciting insights in Simon Sinek‘s business classic, Start with Why, is his concept of “The Golden Circle,” a model that he devised, using three concentric circles to suggest the interdependencies between and among the WHAT, HOW, and WHY great people and great companies succeed. I agree with him that individuals as well as organizations must have a crystal clear sense of purpose or it will be very difficult (if not impossible) for them to decide what to do and how to do it. If they have the right purpose, it will guide and inform their decisions and, meanwhile, inspire and then sustain their efforts. 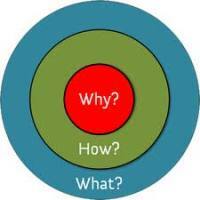 Sinek suggests that the Golden Circle [i.e. beginning with WHY at the center, then proceeding to determine HOW to produce WHAT] “helps us to understand why we do what we do. [It] provides compelling evidence of how much more we can achieve if we remind ourselves to start everything we do by asking why.” Without the right WHY, even great leaders cannot inspire everyone in the given organization to take action. Only with the right WHY can an organization develop great leadership at all levels and in all areas of its operation. Here is a direct link to Simon’s TEDTalk in 2009 during which he explains all this with passion and precision. If you prefer the abbreviated (five-minute) version, please click here. Simon is an optimist. He teaches leaders and organizations how to inspire people. From members of Congress to foreign ambassadors, from small businesses to corporations like Microsoft and 3M, from Hollywood to the Pentagon, he has presented his ideas about the power of why. He has written two books, Leaders Eat Last: Why Some Teams Pull Together and Others Don’t and aforementioned Start with Why: How Great Leaders Inspire Everyone to Take Action and is quoted frequently by national publications. Sinek also regularly shares 140 characters of inspiration on Twitter (@simonsinek).